One of the problems is that these ideas make some kind of sense to the individual. Donald Clark, on his blog, wrote “they have an intuitive appeal but, given the proliferation of these theories, with success based more on marketing than evidence, it is a largely discredited field”. I remember using and recommending learning styles myself. It just seemed right. I knew how much I understood ‘visually’ from completing the questionnaires myself. 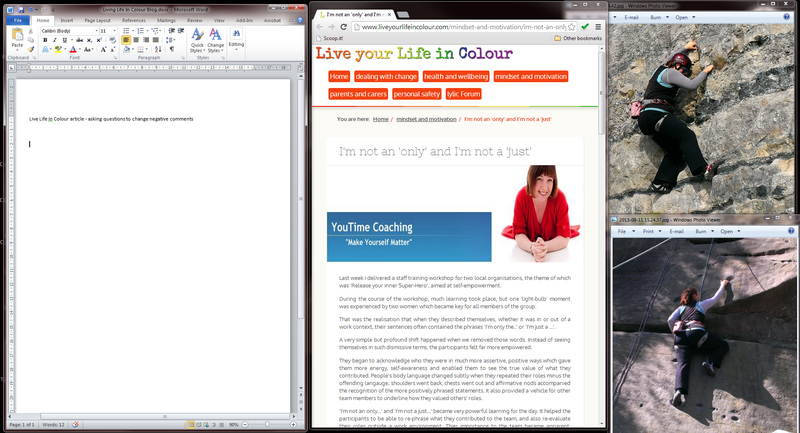 To this day I struggle to drive round my home town without a picture in my head of how the roads and areas connect; when writing some of my blog posts I want the images and visuals to hand for me to be able to think creatively – hence the screen grab below of a guest blog I was drafting at the time about rock climbing. What did I do with this knowledge about learning styles? To be fair, it made me question and evaluate some of my training methods and strive to deliver in a variety of ways. What I didn’t do though was know the learning styles of my attendees. Even if I did, would I have done anything? As Don Clark points out, “no sooner is the questionnaire complete than the PowerPoint is out”. I do recall questioning learning styles a number of years later when doing my degree. A lot of the lectures I went to I wasn’t making notes – I was concentrating on listening and involving myself with the content, delivery and discussions. There are all sorts of arguments here about my attention focus versus note taking and embedding this into long term memory in my own words… I just knew what was right for me at the time. So was I now a visual learner, or an auditory learner? Or was this just not quite right..? There’s all sorts of interesting blogs and articles on the web on this topic, which broadens out to Myers-Briggs and the like. I’ve collected a few of them on a Scoop It page for your delight and delectation. Do let me know if you find more, or opposing views! Jo: This is definitely a good, reflective view on the topic. One (semi-)similar area where I’ve had to re-think my stance is that of Digital Natives vs. Digital Immigrants. As an industry, and as practitioners, we need to keep challenging some of these “sacred cows” and think critically about what we are told. Sometimes its hard to change, but hopefully we’re the better for it. Mark, thanks for the comment on my reflections. Yes, it’s easy to just repeat stuff all the time without questioning it or revisiting it. I like the mindset too that we are better for the change.